Is your yard a little boring? There are many ways to spruce up your outdoor living area. With the resources that are so readily available to you, all you have to do is choose the ones that fit the style and feel that you are trying to achieve outside. Outdoor accessories such as furniture or decorations are an easy way to give your outside living space a touch of flare. Water features like garden fountains are no longer for fancy restaurants or hotels; you can now find garden fountains at many stores in your area. A garden fountain makes a great centerpiece for your outdoor living area, and can give it a kind of serene tranquil feel as well. Outdoor water fountains come in many different sizes and styles, too. They are a great way to leave a lasting great impression on your guests at your next outdoor event. You can even choose a mini-waterfall that is self-contained and requires no plumbing; some even run on solar power. If you feel your space is lacking a little bit of charm, that could be the choice of furniture – or lack of the right furniture – making your outdoor space fall short of wonderful. Having a lot of comfortable seating available makes your place the ideal relaxation spot for your friends and family. Forget having Sunday brunch at small bistro down the road – invite your friends over for a relaxing brunch in your new outdoor living space. Your outdoor living area will make for a great place to hang out and enjoy the Summer breeze. Outdoor furniture has come a long way, too. Now you can get whole sofas, sectionals, and other living sets for your outdoor area, as well as chair and table sets in contemporary and traditional designs. Today many people are treating their outdoor living spaces as an extension of their home. 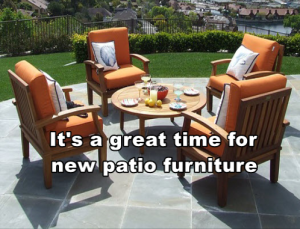 Choosing the furniture types, styles, and sizes all depends on what you plan to be using your outdoor area for, and the budget you have set for revamping the space. Deciding on how to use your outdoor space is entirely up to you. Whether you want it to be primarily for recreation or more for relaxation, contact a design professional from Architectural Landscape Design to get started on transforming your outdoor living space into your dream retreat. We are currently offering free in-home initial design consultations. Let’s get started now to turn your landscape visions into reality!